Samsung, country’s most trusted consumer electronics brand, today launched its new series of Hospitality Televisions (TVs) in India. Samsung’s range of hospitality TVs will help the hospitality industry redefine user experience by providing them with exemplary comfort and stay with not just a TV, but a solution packed with innovative applications and personalised interface powered by Samsung LYNKReach, to enhance overall users’ experience. These televisions have specific and customised use in hotels, hospitals and educational sector as well. The new UHD line up of Hospitality TVs come packed with new age technology like Hospitality/Home User Interface, Soft Access Point, LAN Out along with conventional smart features like, screen mirroring technology which allows seamless streaming of mobile device content on the TV screen. Besides, there is an option to play content via Bluetooth connectivity from any handset – Android, Tizen, Windows, Ubuntu and iOS. Combination of all such features ensures to bring best experience to end users. The new range of UHD TVs is supported by Samsung’s Tizen, the robust OS which creates a rich user experience on mobile devices and the devices they connect to. The all new series brings in the power of High Dynamic Range (HDR10+) picture refinement and delivers an optimal, clarity-defined, detail-rich, immersive viewing, making the experience truly memorable by leveraging dynamic metadata that fine-tunes each frame within a given program. Available in 43”, 49”, 55” and 65” these dedicated hospitality TVs are exclusively designed to match all sort of needs in terms of space and usability. “Samsung has been providing businesses with integrated and customized solutions that result in unparalleled end-users’ experience and satisfaction. This year, with these UHD models powered with Samsung’s Tizen OS, we are expanding our services to suit the need of having a robust consumer interface for hotels, hospitals and education sector. Our latest TVs focussed at the hospitality industry are bound to redefine experience for industry as well as for the end users,” said Mr. Puneet Sethi, Vice President, Consumer Electronics Enterprise Business, Samsung India. Hospitality TVs offer a unique Home Menu or Home Graphic User Interface which allows the institutions to create or add a welcome message, a logo and/or a video on the TV boot-up screen. The range is ideal for creating, editing, real time update of weather, along with software and firmware updating over RF or IP Network. The quad-core processor ensures large cache and higher output. This is essential for multiple application types and user environment in the hospitality industry. USB Cloning allows you to simply copy the TV settings to all TVs using a USB stick, a process that is fully automated to save a lot of time without having to set each TV one by one. Security Mode to block ports, panel buttons, menu etc. The IT team will be able to control the TVs in the rooms via LAN. The hotels, for example can make use of the user friendly ‘Home Menu’ which acts as an information menu, and allows them to save utility numbers such as that of Reception, Housekeeping, Room Service, Travel Desk, Emergency, etc. on the Hotel TV itself. This information is accessible at the touch of a button via remote. The Hospitality TVs also offer ace security features such as enabling the control/ locking the use of USB, HDMI, etc. so that guests cannot have unauthorized access to TV utilities. They also offer analytics driven solution-based interactions with guests, which are two-way in nature. Ensuring convenience and flexibility, the users will have the option to play content via Bluetooth connectivity from any handset – Tizen, Android, Windows, iOS and Ubuntu. For example, in hospitals, the users would be able to utilise an interactive on-screen interface with customizable shortcuts for accessing major functions of TV (Menu, alarm, source etc.). In a hotel, a user can get options based on his/her past preferences at the hotel such as the last breakfast/ lunch/ dinner that he/ she ordered or favourite channel(s) he/ she watched during the past stays in the hotel. One of the noteworthy features includes the muting option or access to bedside headphone to watch the TV and avoid disturbing the others in a room with dual occupancy. Hospitals also have an option to display important contact details of residential doctors and officials of hospitals. Hospitality sector is undergoing a complete transformation in the way they operate with the intent to avail personalized and standardized shopping experience to the customers. 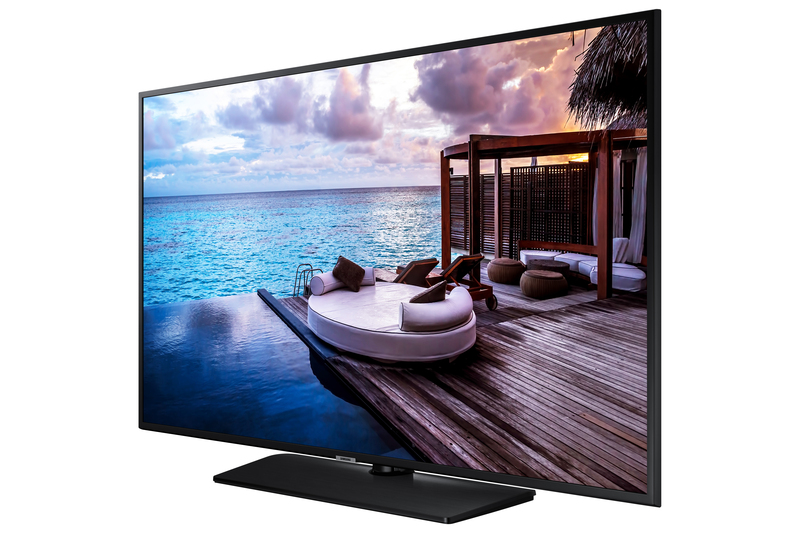 This latest range if UHD TVs will bring Samsung’s innovative technology and smart and engaging display solutions to these enterprises and captivate their respective set of target consumers like never before.